What will make your spring, summer, or autumn Niagara Falls trip even better? Plan it around the dazzling Niagara Falls fireworks. Check the online schedule for May 18-Oct. 8 displays. Nothing compares to combining exciting pyrotechnics with the stirring splendors of cascading natural wonders. Reserve your Niagara Falls Hotels accommodations near the fireworks. Niagara Falls vantage points to behold this stunning spectacle include your Fallsview hotel, Queen Victoria Park, Oakes Garden Theatre, and Journey Behind the Falls. 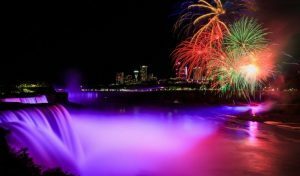 Carrying on a 25-year tradition, Niagara Parks fireworks make the falls even more mesmerizing. All shows explode from the river’s edge, planning to start at approximately 10 p.m. Free concerts precede these big colorful events. Weather conditions from rain to high winds may necessitate cancellations. If that happens, you can still enjoy Niagara Falls fireworks from dusk to midnight, 1 a.m., or 2 a.m. many evenings. Energy-efficient spotlights tint the rushing water an enchanting rainbow of shades. Crowne Plaza Niagara Falls: A late 1920s treasure, the four-star Crowne Plaza stands majestically amid the glorious falls. Its recent upgrade made its classic Victorian charm and sublime amenities even more exceptional. Enjoy plush beds, a shopping concourse, and indoor swimming pool with whirlpool. Visit the Rainbow Room, a renowned Italian restaurant, to savor panoramic views that are as wonderful as the delectable cuisine. Sheraton on the Falls: Indulge in four-diamond luxury with modern appeal and amazing waterfall backgrounds. The Sheraton features comfortable suites and rooms with private refrigerators. Shared guest areas include indoor and outdoor pools. Dining treats range from Windows by Jamie Kennedy for tempting locally grown specialties to Fallsview Buffet’s tasty international variety. Both ensure breathtaking falls and fireworks sightings. Your Canadian Fallsview hotel options extend to Clifton Victoria Inn at the Falls, Marriott Fallsview, Marriott on the Falls, and Skyline Hotel. Peer out any window to see the unbelievable surroundings, overflowing with crashing water and picturesque scenery. Choose this prime garden location on Niagara Parkway to delight in spectacular sights from every angle. Take in sweeping vistas of the Niagara Falls fireworks from the Grand View Marketplace. Open since 1888, Queen Victoria Park features beautiful floral displays, hanging baskets, rock and tea rose gardens, native to international plants, and lush greenery. Relax on park benches and lawns under mighty shade trees. Year-round admission is free. At the Queen Victoria Park entranceway, you’ll notice this captivating garden. Besides being an ideal spot to watch the falls and fireworks, it hosts summer concerts, movie screenings, and other events. This 1936 architectural wonder features a pergola curving along the landscape’s contours to overlook the central amphitheater. Popular Oakes Garden Theatre sites include the ornate iron gates, serene Japanese garden, wishing bridge, lily ponds, and rock gardens. Where can you get a unique Niagara Falls view from the back and bottom? Descend 150 feet by elevator at Journey Behind the Falls. Traverse the 150-foot tunnel network to pairs of portals and observation deck levels. During this after-dark experience, you’ll witness a deluge of 20 percent of the earth’s fresh water supply plunge a staggering 13 stories! 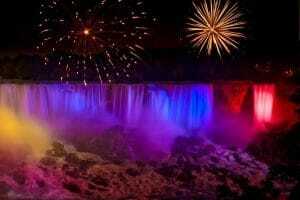 Up close at the Horseshoe Falls base, watch the rainbow-colored cascades and fireworks show. Operation hours vary by month and day. Check the online schedule for any specific date to see if it extends until the fluctuating dusk illumination or 10 p.m. pyrotechnics set-off time. A hooded rain poncho will protect your hair and clothes from the spray. If you plan to shoot photographs, make sure your camera is waterproof. Reserving one or more rooms or suites for yourself and your family or other traveling companions is easy online. Niagara Falls Hotels features 165 possibilities from luxurious resort hotels and cozy inns to kid-friendly motels and homey bed and breakfasts. If your crowd enjoys adventurous vacations, consider a campground instead. Then book your chosen accommodations online. Our website is a comprehensive tourist resource for more than just lodgings. Discovering diverse restaurants and attractions will help you prepare for your memorable Niagara Falls trip.